Grand Theft Auto 5 received its most anticipated feature today: cooperative heists. Console gamers can now team up on complex missions throughout Los Santos for no additional charge. Heists are 4-player missions with multiple parts. They'll test players' flying, stealth, driving, and combat skills among others. On top of all that, each team needs to communicate and work together effectively to pull off the job. In some cases, you'll have to split up to perform different objectives simultaneously. The heists are designed so that you'll want to replay them at least a few times. You can try a different role in your next go-around for a different experience. Also, your team can strive to complete Elite Challenges for extra GTA$. GTA 5 players have been waiting for online heists since the game's multiplayer first went live. Heists were arguably the highlight of the single-player campaign so it's only natural that players would want to experience similar missions with friends. Unfortunately, they've had to wait much longer than expected for heists. Today's large update to GTA 5 has more than just heists, though. It also adds three more competitive multiplayer modes. New Daily Objectives and Freemode activities give players additional ways to pass the time and make some money. 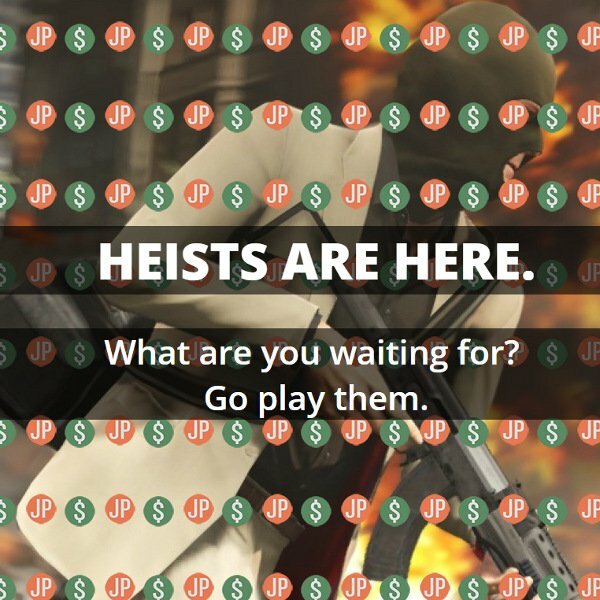 Online heists will also be part of the upcoming PC version. They'll be available as soon as that version launches next month.